Foto tomada durante la Primera Guerra Mundial, cerca de Ypres, Bélgica, en 1917. El soldado con el brazo izquierdo vendado presenta una mirada de los mil metros, una manifestación frecuente de la neurosis de guerra. Algunos hombres que padecían de neurosis fueron llevados a juicio, y hasta en algunos casos ejecutados, por crímenes militares que incluían la deserción y la cobardía. Si bien se reconocía que el estrés de la guerra podía debilitar a los hombres, un episodio duradero solía verse como un síntoma de falta de carácter.​ Por ejemplo, en su testimonio a la Comisión Real posguerra que investigaba la neurosis, Lord Gort afirmó que esta era una debilidad y que no se encontraba en «buenas» unidades.​ La presión constante en evitar que fuera reconocida médicamente significaba que la neurosis no era una defensa admisible. ↑ a b Crocq, M. A. y Crocq, L. (2000). «From shell shock and war neurosis to posttraumatic stress disorder: a history of psychotraumatology». Dialogues in clinical neuroscience (en inglés) 2 (1). Consultado el 11 de agosto de 2018. ↑ Roudinesco y Plon, 2008, p. 753. ↑ a b Hochschild, Adam (2012). To End All Wars - a story of loyalty and rebellion, 1914-1918. Boston, New York: Mariner Books, Houghton, Mifflin Harcourt. pp. xv, 242, 348. ISBN 978-0-547-75031-6. ↑ «Post-traumatic stress disorder (PTSD)». Doctor's Lounge (en inglés). Consultado el 11 de agosto de 2018. ↑ Jones, Fear y Wessely, 2007, p. 1641. ↑ a b Shephard, Ben. A War of Nerves: Soldiers and Psychiatrists, 1914-1994. Londres, Jonathan Cape, 2000. ↑ Loughran, Tracy (2012). 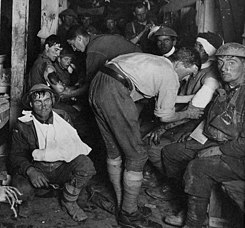 «Shell Shock, Trauma, and the First World War: The Making of a Diagnosis and Its Histories». Journal of the History of Medicine and Allied Sciences (en inglés) 67 (1): 94-119. Consultado el 17 de agosto de 2018. ↑ Linden, S. C., Hess, V., Jones, E. (2011). «The neurological manifestations of trauma: lessons from World War I». European Archives of Psychiatry and Clinical Neuroscience (en inglés) 262 (3): 253-264. Consultado el 17 de agosto de 2018. ↑ Wessely, 2006, p. 443. ↑ «Combat Veterans’ Brains Reveal Hidden Damage from IED Blasts». Johns Hopkins Medicine (en inglés). 14 de enero de 2015. Consultado el 12 de agosto de 2018. ↑ Taylor-Whiffen, Peter (3 de marzo de 2011). «Shot at Dawn: Cowards, Traitors or Victims?». BBC History (en inglés). Consultado el 12 de agosto de 2018. ↑ Norton-Taylor, Richard (16 de agosto de 2006). «Executed WW1 soldiers to be given pardons». The Guardian (en inglés). Consultado el 12 de agosto de 2018. ↑ Hipp, 2005, pp. 1-3. ↑ Hipp, 2005, p. 54. ↑ Hipp, 2005, p. 168. ↑ Winter, Jay (2000). «Shell-Shock and the Cultural History of the Great War». Journal of Contemporary History (en inglés) 35 (1). JSTOR. pp. 11-7. Consultado el 18 de agosto de 2018. ↑ Práce, B. (2012). The Function of Seymour Glass in the Conceptual and Textual Persona and Fictional Output of J.D. Salinger (en inglés). Universidad Carolina. Consultado el 17 de agosto de 2018. ↑ Guðjónsson, Daði (2012). «Avoiding the Banana Hole. A Psychoanalytic Reading of the Character of Seymour Glass in J.D. Salinger’s Shorter Fiction» (en inglés). Consultado el 17 de agosto de 2018. ↑ Kim, J., Hartzell, G., Dawson, V. y Furman, A. (2017). «Teaching Trauma and Narrative: Using Salinger’s For Esmé—with Love and Squalor». Academic Psychiatry (en inglés) 41 (6): 737-740. Consultado el 17 de agosto de 2018. Hipp, D. (2005). The Poetry of Shell Shock: Wartime Trauma and Healing in Wilfred Owen, Ivor Gurney and Siegfried Sassoon. McFarland. ISBN 9780786421749. Jones, E.; Fear, N.; Wessely, S (2007). «Shell Shock and Mild Traumatic Brain Injury: A Historical Review». Am J Psychiatry (164): 1641-1645. McLeod, A.D. (2004). «Shell shock, Gordon Holmes and the Great War». J R Soc Med 97 (2): 86-89. Presley, J.W. (2010). «Neurasthenia and the Cure of Literature: Robert Graves, Siegfried Sassoon, Andy Collins». JAC 30 (1/2): 269-313. Roudinesco, E.; Plon, M. (2008). «Neurosis de guerra». Diccionario de psicoanálisis. Buenos Aires: Paidós. pp. 753-754. Wessely, S. (2006). «The life and death of Private Harry Farr». Journal of the Royal Society of Medicine 99 (9): 440-443.